Shri Saibaba Sansthan Trust, Shirdi, is the Governing and Administrative body of Shri Shirdi Saibaba's Samadhi Temple and all others temple located in the Shirdi Sai Baba temple premesis and this trust is devoted towards development of Shirdi Village. In order to provide better service to the pilgrims, Shri Saibaba Sansthan Trust has opened Information Centre in Mumbai, Chennai, Bangalore and Secunderabad (Hyderabad) apart from the Infromation Centre available in Shirdi Saibaba Temple,Shirdi. 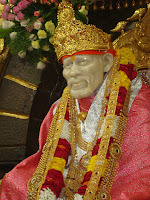 Shri Saibaba Sansthan Trust, Shirdi (Post), Rahata taluq, Ahmednagar Dt. - 423109, Maharastra. 02423-258500, 02423-258770(Fax).